December 26, 2017 -- Mayor Sylvester Turner has launched a web page explaining the city's requests for federal funding for Houston's recovery from the Hurricane Harvey floods and projects that will lessen flooding in Houston in the future. "Houston has come to the aid of other Gulf Coast communities in their time of need and represents an essential hub for American energy, medical treatment, shipping, aerospace, and trade," the mayor writes on the web page. 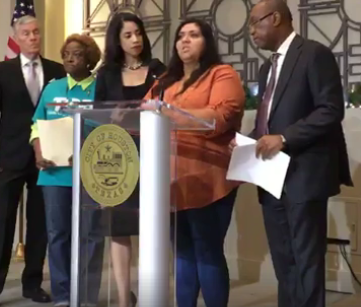 "Working with our Congressional delegation, we need the federal government to come to our aide to help build a more resilient city that has learned the lessons of Harvey. Without flood mitigation, rebuilding dollars are just funding for future failure." The page goes into details about the city's need for federal Community Development Block Grants, Community Disaster Loans, flood mitigation projects and environmental reviews. PostHarvey.org, which will be updated periodically, also includes news reports, interviews and opinion pieces about the city's funding efforts, along with about 20 letters and relevant documents.